“Lots of spooky Pokémon are appearing all over the world, including Ghost-type Pokémon from the Hoenn region. Halloween season is here again, and that means more spooky Pokémon fun! This year is extra special with your very first chance to encounter Pokémon that were originally found in the Hoenn region of Pokémon Ruby and Pokémon Sapphire, including Sableye, Banette, and others. 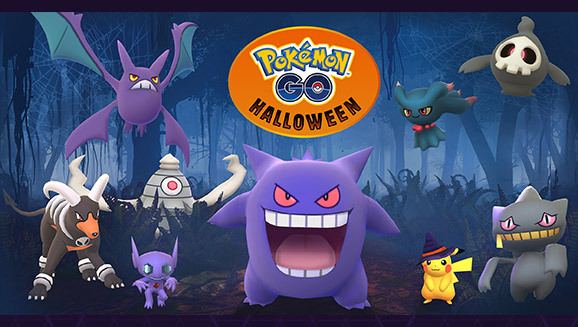 They’ll be joined by more spooky Pokémon such as Gastly, Cubone, and Drowzee in greater numbers when you head out into your neighborhood. Pikachu is also getting in on the Halloween festivities. Keep an eye out for a special costume-wearing Pikachu for a limited time! The rest of the Pokémon first seen in the Pokémon Ruby and Pokémon Sapphire video games will gradually arrive starting in a few months’ time—possibly as early as December! For now, we hope Trainers enjoy this special treat during Halloween. Give yourself a little bit of Halloween flair, too! Look in your avatar’s Style section in the Pokémon GO app to discover the special Mimikyu’s Disguise Hat for your avatar. Halloween is all about candy, and the Pokémon GO celebration is no different. During the Pokémon GO Halloween event, all Candy rewards (except for Rare Candies) will be doubled! Plus, there will be opportunities to stock up on supplies with discounted special boxes in the in-game shop. Next articlePC and Mac Aren’t All That Different!